When John Tang was earning his doctoral degree at Georgia Tech in the 1990s, he saw the vast differences between media in China and media in his adopted home. Under the constraints of media censorship, people in China did not know, for example, what really happened in Tiananmen Square in 1989, and people outside China did not know the severity of the persecution of people with unapproved spiritual beliefs, such as Tibetans, Uyghurs, and Falun Gong practitioners. With the growing awareness that no one was telling the true stories about what was happening in China, John Tang and other Chinese-Americans founded Epoch Times in 2000. 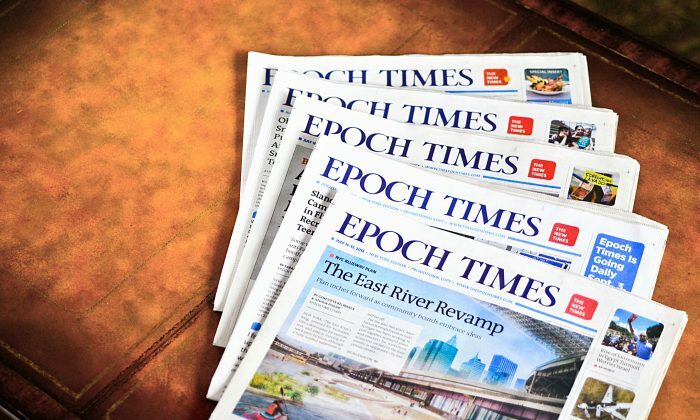 The story of Epoch Times is the story of those who wanted to meld their concern for their homeland with the freedoms afforded by America, such as freedom of the press and freedom of belief. The first edition was in Chinese, with English language editions hitting the streets starting in 2004. As the current president of Epoch Times, John Tang now works to have editions published in 21 languages and in 35 countries. Wherever they are, Epoch Times editions tell the stories about China that other media cannot, or will not. You may see a greater quantity of coverage of China in other newspapers, but you will certainly see quality of insight into China in Epoch Times that you cannot find elsewhere. Media coverage inside China is censored, whether it is coverage by local media or by foreign media. Chinese media has become more sophisticated in managing its message—but at its core it is still the Party line. Under the communist regime, there is no real freedom of the press. Foreign media companies with bureaus and correspondents in China seem to have greater access and latitude than in the past, but they can have permission revoked without notice, and as a result they self-censor assiduously. Whether because of external censorship, self-censorship, or analysis that misses the key points, these media will not report stories that the regime doesn’t want you to know, or they will report them only partially, without what is essential. The Epoch Times English-language edition draws its China news from a network of sources inside China plus the expertise and contacts of Chinese expatriates living in the West, including our colleagues at the Chinese-language Epoch Times. Epoch Times correspondents living in China in 2000 were imprisoned, but the current staff of the Chinese-language Epoch Times, in Hong Kong, Taiwan, the United States, and elsewhere report without fear. They have gained a huge readership among Chinese worldwide, plus as many Chinese inside China who can circumvent the regime’s tight control of the Internet. The Chinese-language Epoch Times is the most widely distributed newspaper in the world. If you are not Chinese, China is still important to you. China is the most populous nation, with the world’s second-largest economy. Chinese is the third-most-spoken language in the United States. Three decades ago, China was remote, mysterious, and mostly irrelevant to the daily life of citizens of developed Western nations. China has changed from a policy of isolation to one of building the economy through export. Technology advances like containerized shipments and the Internet have made it possible to mix people, products, and ideas rapidly. Now Chinese products are in your hands every day. Chinese-made clothes are on your back. Chinese-made food and drink are in your stomach. What happens in China has a real and direct impact on your personal health and your future at all levels. Protests and poor working conditions in a Chinese factory are connected with that electronic device on your desk or in your hand. Corruption exposed in Shanghai, or a legal system making Party-dictated rulings in Beijing, can rapidly alter your supply chain or your investments. Chinese companies that buy Western companies can bring compromised ethics to their new subsidiaries. The state-sponsored Confucius Institutes quietly bring communist values to university campuses. Over the millennia, China has been the source of great good, as well as great evil. The extent of the evil is spelled out in the 2004 Epoch Times editorial series Nine Commentaries on the Communist Party. The Chinese Communist Party has been responsible for more than 80 million unnatural deaths in China since its inception, and continues to kill innocent people today. The regime has polluted the land. It enables export of contaminated products. It has placed its spies in all levels and positions of Western societies. We bring you these stories. On the other hand, China’s history and culture, with stories of heroes and noble conduct, its arts, its spiritual traditions, its traditional medicine, and its sumptuous regional cuisines can benefit and deepen our daily lives. Epoch Times embraces the best of traditional China and we bring it to you in our pages.